WITH the fast pace of life in the GCC and Europe, more people are looking for the ultimate relaxation when travelling to the UK either to see relatives or simply to indulge in shopping over the holiday periods. For this reason, cruising has taken on a new light offering the luxury of five-star service, an array of entertainment options and fine dining all while relaxing at sea. The Queen Mary 2, flagship of the Cunard line and the biggest ocean liner in the world, is not only known for its Trans-Atlantic crossings (having recently celebrated its 10th anniversary of the iconic journey from Southampton to New York) but also offers a range of shorter voyages along the European and Scandinavian ports. With Emirates flying daily into the Norwegian capital of Oslo, this option has proved popular for those seeking a comfortable taste of the icy comfort, or a brief brush with Viking history. Known for its ability to go “the extra mile” for its passengers, the Queen Mary 2 can make special arrangements for its Middle East and Muslim passengers given enough advance notice, says Glenn Millway, food and beverage manager. Not only are special dietary requirements catered to, including the provision of halal food, but during such periods as ramadan, a separate dining area can be set up for Muslim guests so they are able to dine outside of the usual early and late sittings normally offered. The on-board Canyon Ranch Spa, one of the most luxurious spa groups in the world, also will make special arrangements to fit in around the needs and requirements of all passengers, including Muslim women who may wish to use the spa outside of the hours usually frequented by both male and female passengers. Spa director Amanda Wilson says that private hours can be arranged for women-only groups wishing to indulge in privacy. The next Queen Mary 2 world cruise begins from Southampton on January 10, 2015 travelling through Dubai and Abu Dhabi, where GCC passengers can embark, or disembark if they wish only to travel a part of the journey. For families travelling together, there is the option of adjourning suites, connecting state rooms, or a range of classes to suit both travellers and staff if required. The range of accommodation is topped by the five Grand Duplexes, which include two staff – a butler and an assistant; two walk-in wardrobes; three bathrooms – one for guests, an en-suite and a full-size bathroom with a spa bath/jacuzzi from where guests can look through the full-size window at the ocean; a range of entertainment and/or work options including iPad, games consul, television, DVD player, binoculars to watch the dolphins and whales spotted during the journey, treadmill for private exercise; and also a private food preparation kitchen to cater for snacks and meals and that’s not to mention the private deck to sunbathe giving all the privacy such a suite commands. There is also a full Kids Club catering for children from babies to teenagers with supervised play and entertainment through to meal-times and a structured dinner schedule to fit in with parents’ plans. And even the possibility – with enough notice – to charter the whole ship, complete with its 1,253 crew. 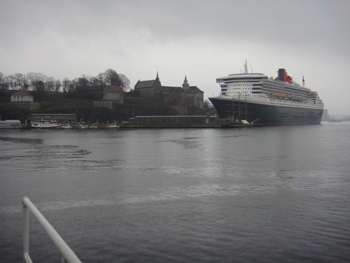 Tours are available in every port and every cruise from the two to three day journey from Hamburg to either Southampton or Oslo, through to the longer 26 night breaks. These short cruises are offered on all three Cunard luxury liners in The Norwegian Fjords; The Baltic Sea; Around Britain; The Caribbean; New York, New England and Canada; The Mediterranean; Iberia and the Canaries; not to mention the various legs of the World Cruises. For those who want to see these distant places, cruising on the luxurious Queen Mary 2 offers a true holiday without the stress of a long flight, as well as the bonus of continuous food service, spa luxury, music and entertainment, a cinema with current movies, games, swimming pools, lectures and classes on everything from dancing to computers and even a planetarium. And expats heading back home, can take their canine friends on board to be looked after by their own Kennel Master.